This week we are looking at photogrammetry apps, which allow you to create a 3D scan of an object using only your phone. The last three reviews have focused on some of the ways of disseminating digital context to users and visitors, creating an immersive experience. We are changing the focus in this review to look at what tech is available for museums to use to create the digital content itself. With this in mind, we are changing the scoring criteria slightly – ‘Education’ and ‘Fun’ will be replaced with ‘Potential for museums’ and ‘Quality of output’. As the focus of these reviews is on low-cost and free options for museums, we only used those apps that were free to download and didn’t require any additional equipment. While trying to find suitable apps, we were unable to find any apps that satisfied these criteria that were available on both Android and iOS phones. As a result, we have picked and reviewed two different apps, one for each operating system. Photogrammetry apps provide a brilliant opportunity for museums to create 3D models of their objects, which can be embedded on museum websites or post and view on platforms such as Sketchfab, which we will be reviewing next week. This means that museums can make their collections accessible to a wide audience, helping to share objects that might be hidden away in stores. It also helps to redress the balance of digitisation away from 2D objects such as documents and photographs, which have received far more attention due to the relative ease of their digitisation. However, with developments in software and prevalence of smartphones, 3D objects can now gain more prominence online. Unfortunately, as we do not work in a museum, we do not have access to wonderful objects to scan. 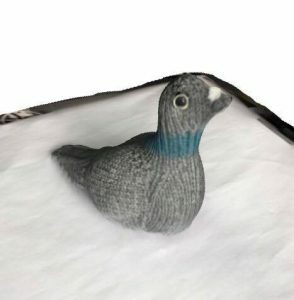 As a result, we have used a knitted carrier pigeon, which was given to us from the Telegraph Museum Porthcurno. We would love to see how this would work in a museums context, so if you would like us to test these apps out further on any of your collections items, get in touch. Scann3D deploys patent pending photogrammetry technology to enable true 3D model capture and reconstruction for smartphones and tablets. Your device becomes a standalone tool to turn images into 3D models – all your images are processed by and on it. The app essentially offers users the possibility to digitise objects in 3D format. This is an updated version of a previous app called 123DScan. An object in plain background preferably and in good lighting. TIP: Reflective, transparent, and untextured, homogeneous objects do not make good models. The app should now give you the opportunity to take pictures of your object. The app requires that you take at least 5 different pictures from different angles of the object, but I would say that 20-25 pictures will give you the best results. Once you’re done click on the tick option. The app will then take some time to load your object. Your 3D-digitised object will be stored in My Models. You can revisit it any time, download it or send it to someone. The app itself does not give you the option to download your 3D-digitised object. You’ll need a follow-up app to be able to transfer it and view it somewhere else. We are going to look at Sketchfab – a platform that lets you upload and view 3D-digitised objects. Trnio makes your iPhone to into a high-quality 3D scanner, using a cloud service to convert images into hi-resolution photo quality 3D scans. Click on three turquoise lines in the top right of the screen and click on ‘Tutorial’. This will bring up a video, which is worth a watch. After watching the tutorial video, click done and return to the main screen. Choose the object that you want to scan and place it on a plain surface. We used a piece of flipchart paper as it was a large, white surface. Click on the turquoise camera icon at the bottom of the screen. Make sure the object that you want to scan is within the circle on the screen and click on the smaller circle in the middle. Wait for a few seconds while the camera ‘blinks’. From this point you don’t have to click on anything, just start moving very slowly around the object. As you move, you will notice that small turquoise circles appear on the screen. These present the photographs that the app has taken to form the 3D image; the more circle the higher the quality of the scan. Make sure that you keep the same distance from the object, but also make sure that you vary your height as you walk around. This will ensure that all angles of the object being scanned. Once you have completed a full revolution of your object, press and hold the small circle in the middle of the screen – this will save the images. Click on ‘Queue’ on the top right of your screen. This will then show you the progress of the upload of your scan. If you are happy with your scan, press ‘Publish’ on the top right of the preview screen. Your 3D-digitised object will be stored within your profile on the app. You can revisit any time, download it or import it directly to Sketchfab. This app relies on a continuous stream of photographs, which are taken automatically as you walk round, making this app slightly easier and more straightforward to use. As this is a cloud-based app, it takes a considerable amount of time to create a preview of your scan and then more time to upload this. It might not work from the very first time – it took us 3 failed attempts to finally get it right. The app itself does not give you the option to download your 3D-digitised object. You’ll need a follow-up app to be able to transfer it and view it somewhere else. We are going to look at Sketchfab. This app can only be used on iOS. These apps are great tools which offer anyone the opportunity to 3D-scan an object. The fact that it is free makes it accessible to anyone, anywhere. We thoroughly enjoyed the possibilities these apps offer.